1 - Giving your child their own copy of The Book of Mormon, a Reading Chart (found on foodstorageandbeyond.com) and a Bookmark (found on sugardoodle.net) You will also look at the pictures and talk about your favorite stories! 2 - How did we get The Book of Mormon? There is a Short Video(from lds.org) to watch. 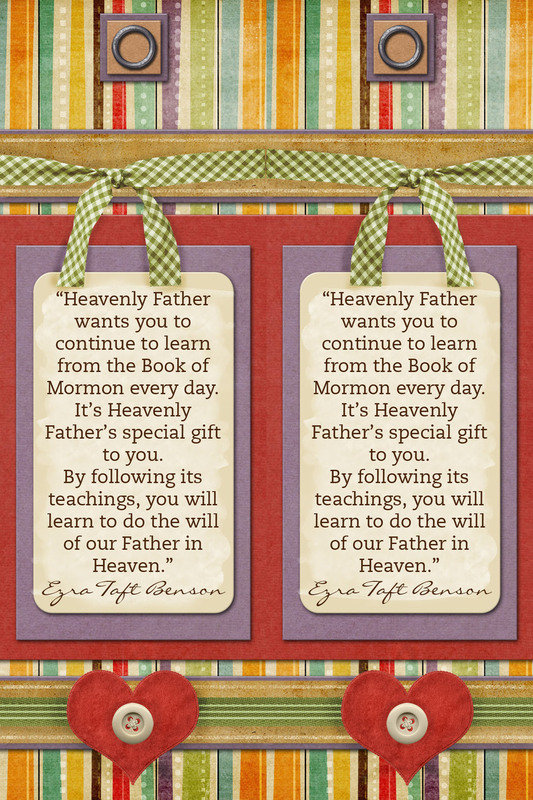 Then you will look at Joseph Smiths testimony in the front of The Book of Mormon! 3 - In this lesson you will talk about translating and what that means with a fun little activity to help your child understand. 5 - This lesson is about the gold plates, including an activity so they understand better what they looked like. 7 - This is the final prep lesson where you talk about how The Book of Mormon is made up of smaller books, you will also look at where you will start reading The Book of Mormon first! When I did this with my daughter she loved it! The day we gave her a Book of Mormon of her own she sat "reading it" by herself on and off all day! She enjoyed translating and figuring out that it was her name. She also loved making the "gold" plates. By the time we finished this whole introduction she was basically begging to start reading the Book of Mormon! Now that we have actually started reading the Book of Mormon using the study guide and scripture people she keeps telling us to hurry up and read more! As I finish the Study Guide with her I will put it up here, I just want to work through and make sure there are no issues first! PS - It also took us about 9 or 10 days to get through this! No family is perfect at reading scriptures. But here is something interesting that I started doing a couple months ago that works great. Before reading the scriptures every night we sing some Articles of Faith. We started off just singing number 1 and now we are up to six - that is right my daughter who is almost 4 has memorized 6 articles of faith! Love it! So on nights where we are short on time or she is a little too cranky we just sing a couple Articles of Faith and then say family prayer, so we can get her to bed!